During the setup wizard, you will be prompted to generate this documentation. However, if you make a change in your scripts, you’ll need to update it. 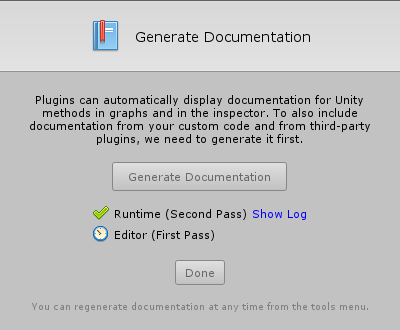 To do so, open Tools > Ludiq > Generate Documentation… and click Generate Documentation. If documentation generation fails, don’t panic! It is entirely optional for Bolt to run, and you can skip this step in the setup wizard. If you want more details about the failure, just click Show Log. Usually, your system is just missing MSBuild.